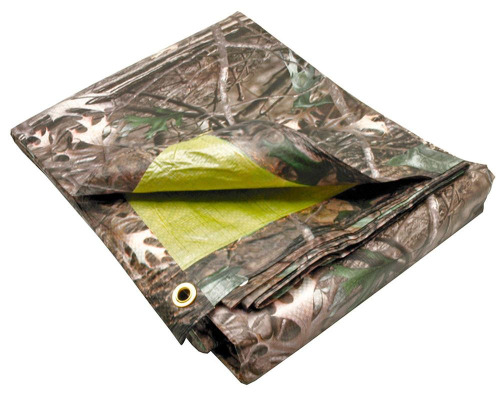 The Lost Woods All-Purpose Tree Camo Tarp is ideal for a variety of purposes. The highly detailed design provides excellent concealment for hunter's and their equipment. Warm earth tones with green leaf contrasts add depth and realism to this tree camouflage pattern. Full repeating pattern can cover a large area without a problem. The tarp features a solid khaki colored backside as opposed to white. Lost Woods Tree Camouflage - Keep Dry. Stay Hidden. Finished Size: 9' 6" x 9' 6"